Taking all these photos of candy experiments is making me snacky. I've had to slice lots of apples as sweet replacements. My toddler is also getting into the spirit of things. Since I gave her all my Pop Rocks discards (many packages had failed so that the Pop Rocks had all stuck together and lost their fizz), she's been putting them into her own bowl of water. When I caught her licking fragments off her fingers, she gave a guilty start and started plucking them off her tongue to drop in the water. 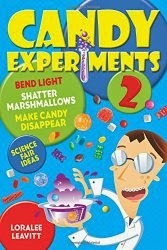 Yet another reason never to eat candy experiments!